This program is intended for children/youth, with special needs, who want to enjoy riding a bike and their parents/caregivers. Biking with family and friends is a great way to enjoy the outdoors, exercise and simply have fun! During a Bike Clinic appointment, children/youth and their parents/caregivers will have an opportunity to meet with the Bike Clinic Team, including a physiotherapist, a recreation therapist and a technician. Your child’s abilities and bike riding goals will be explored. The team will help determine what type of bike, adaptations, and tips and tricks would make riding a bike successful. 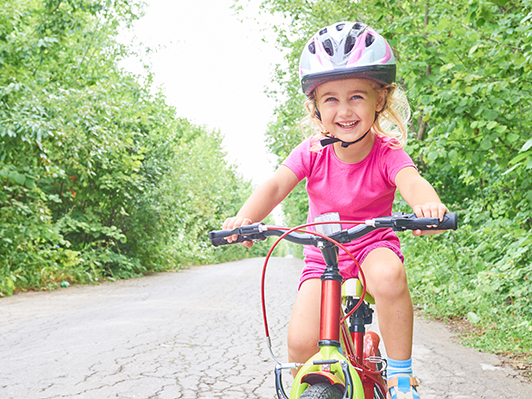 At the completion of the appointment, the team, with the support of the family, will provide strategies, suggestions and resources to meet your child and family’s bike riding goals. Dates/Time: Mondays, April 8, 15 & 29, May 6 & 13 and June 3, 10 & 17, 2019, between 3:15 p.m. – 6:15 p.m. Parking: in Visitor Lot 7 at $4/hr. Register: Contact Sandra Ryall at 519-685-8700, ext 53478 or sandra.ryall [at] tvcc.on.ca to book an appointment. Therapists can also forward an internal referral for “Bike Clinic” on behalf of families. Dates/Times: Thursday May 30, 2019 between 4:00 - 7:00 p.m. or May 31, 2019 between 10:00 a.m. - 1:00 p.m. If you have questions about the Clinic, please contact Karen Faragher, Recreation Therapist at 519-566-3364 or karen.faragher [at] tvcc.on.ca.